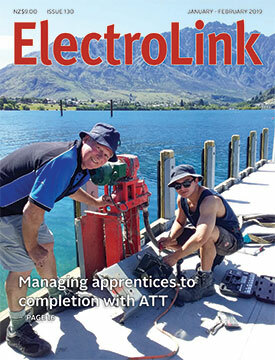 Since he started his electrical contracting business in Queenstown 18 years ago, Mike Ford has always seen apprentices as key to developing a prosperous electrical industry. Ford says investing in apprentices is the best way to solve the tradesman shortage long term while increasing the productivity of businesses hosting apprentices at the same time. As a director of Laser Electrical Queenstown, he says he always has two to three apprentices in training, and managing them today has never been easier. That’s because his company now contracts in a professional electrical apprentice management service, leaving him free to run the business knowing his apprentices are being well looked after. Ford says having his apprentices employed and mentored by the Apprentice Training Trust (ATT) and hosted and managed by his company, sheds much of the risk of taking on apprentices while gaining all the benefits. “Having ATT professionally mentor and manage our apprentices through all stages of their training frees up our time so we can focus more on delivering the on-job training and running our projects. Electrical contractors in Auckland for a long time now have become frustrated by prices their local lines company charges their clients for new connections and capacity upgrades to existing connections. The Auckland branch of Master Electricians has held a series of discussions with Vector over the years but little or no progress has been achieved on the outstanding issues of pricing, the transparency and contestability of pricing, and service delivery times. Master Electricians board member, Dave Burt, whose electrical contracting business operates nationwide from branches in Auckland, Hamilton, Wellington and Christchurch, says the pricing and performance issues are particularly significant in Auckland and Master Electricians wants to see improvements in pricing contestability and the service delivery provided by Vector. Burt says the dissatisfaction is such that Vector needs to develop a new business model that is more responsive to power consumers and where the costing of new or enhanced connections is more proportionate with usage and aligned with market-competitive pricing for the installation. One of the most significant changes to the lawful way of carrying out prescribed electrical installation work has been the shifting of the compliance pivot from the completion of a certificate of compliance (CoC) to the safety verifications required for the connection of this work. Following the implementation of the Electricity (Safety) Regulations in 2010, the issuing of an electrical safety certificate (ESC) declaring, post connection, that the installation resulting from the work is safe to use has become the key document for ensuring the safety of the public and the safe use of the installation in workplaces under the new health and safety legislation. ElectroLink has addressed this in articles since the development of the new certifying process both before and after it became law. Following the publication by the Electrical Workers Registration Board (EWRB) of a recent disciplinary hearing, ElectroLink looked to do a follow-up article using this case to show the consequences of ignoring the protections provided for electricians and inspectors in the new connection and certification processes. The disciplinary case, which resulted in a $1500 fine plus costs, was addressed in the June issue of the Board’s Electron newsletter. The guilty finding appeared likely to have to have centred on the failure of the electrician to have carried out the mandatory safety verifications he had to complete before he connected his work. Ever since the Standards Council unlawfully revoked the only standard developed in New Zealand to ensure the electrical safety of aviation installations in 2007, there has been no standardised means to wire airport and aviation installations for 115 and 208 volt, 400 hertz supply. Not only has there been no government-recognised document for the construction of aviation facilities for electricians and inspectors to demonstrate compliance with, there has also been no standardised documentation process for avionics engineers and electrical personnel to use to ensure safe supply distribution systems to ground support electrical equipment for large aircraft in hangars and workshops, as well as to aircraft on the tarmac. 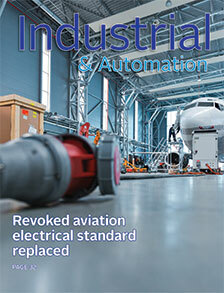 The Standards Council’s ill-advised decision also left the aviation sector without a recognised means of demonstrating the safety and compliance of the specialised aviation electrical equipment necessary to work on fittings of an aircraft in aviation workshops. That is about to change with the New Zealand Standards Approval Board having finally approved a new Section 6 for NZS 6114 to replace the same section revoked by the Council twelve years ago. While never cited in the Electricity Regulations, NZS 6114 was designed to help take care of the safe supply of electricity to installations and equipment operating at non-standard voltage and frequencies, and remains in effect today. The standard covers installations that sit outside the truncated MEN/standard-low-voltage focus of Part 2 of AS/NZS 3000. When tradesman John Jones built an ornate Gothic drinking fountain for the parched residents of Wanganui in 1881, he probably didn’t anticipate it featuring in the 2018 IES lighting awards. That’s perhaps because the original lighting provided by the fountain was powered by gas and the first reticulation of electricity did not occur in New Zealand until seven years later in the bustling metropolis of Reefton. Named in honour of the presciently-named first mayor of Wanganui, William Watt, who donated a lake to the town as a water supply, the Watt fountain is now illuminated by electricity and LED lighting thanks to the exceptional design by Michael Warwick of MAW Design. Warwick’s design was recognised in November with an IES Excellence Award for luminaire design for his success in converting the historic gas lanterns to electric while maintaining the aesthetic and integrity of the original craftsmanship. The project also involved the addition of lighting to the fountain base and the niches. What lighting would you put in a cleanroom? This is a highly specialised field. The work carried out in cleanrooms is often very detailed and needs a high light level with good uniformity and good colour rendering. Further complicating the selection process, there are different classifications of cleanroom and the choice of lighting is usually dictated by this classification. A cleanroom is an area designed to protect products and processes from contamination. Usually these rooms are processing areas for food, pharmaceuticals or medical devices, but other things are assembled in cleanrooms and hospital operating theatres are cleanrooms too. 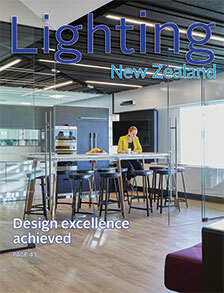 In New Zealand, people working in the lighting industry are likely to come across cleanroom standards through design and construction projects for the meat and dairy industries. The classification of a cleanroom is based on the number of airborne particles permitted in the space. Most cleanrooms will have an ISO 14644-1 classification, where ISO 9 is normal air and ISO 1 is the cleanest.